When in doubt, black on black on black. That’s my motto, anyway. With sweater weather in full swing, I’m slowly but surely dipping into my sweater collection. First on that dip list? Cashmere. And, more specifically, this black cashmere sweater by Club Monaco. It’s no argument that cashmere is one word: yummy. Typically, I reserve that word for food and drinks, but this black cashmere sweater definitely deserves it. It’s perfect for a few reason. First, the soft turtleneck. Not suffocating and so cozy. Next, the ribbed detailing all over the sweater. It adds a bit of uniqueness to an otherwise very traditional fabric. Also, the subtle “batwing” effect on the arms make this black cashmere sweater perfectly relaxed. 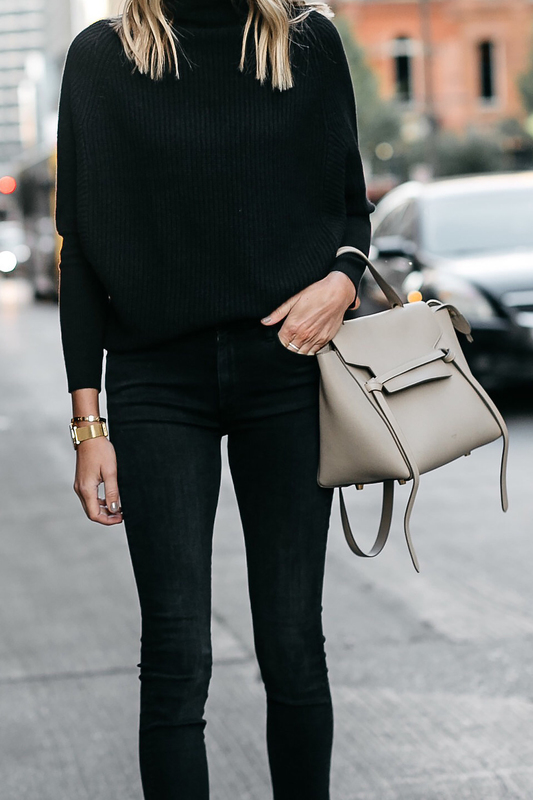 It’s just an ideal structure in terms of cozy, gorgeous sweaters. And the best part? It can be effortlessly dressed up or down. For this look, I went full-chic with a black on black look. However, it would look just as amazing with regular blue jeans. If you’re in the market for a black cashmere sweater, I’ve found you the perfect one. Do yourself a favor and add this to your wardrobe for winter. You won’t regret it! I need a little help for the measure: you wear an xs, how tall are you? are you a s size? I’m a s size, a 3B, 163 cm tall. I’d want to be safer in the choice of the size! Hi! I’m fairly small in build but tall at 5’10 – hope this helps!